Wishing you all a very Happy Thanksgiving! Everyone in my family is healthy this year and this is what I'm most thankful for because without health you really don't have anything. What are you most thankful for? Little Miss A. and I have been busy prepping yesterday. We did the placecards and the filling and cake parts of this dessert (Yes it has three parts!) and this morning we will work on the meringue and assembly as well as do the butternut side dish I'm completely obsessed with I have blogged about before. My mom does the turkey and her famous pecan pie. So, yes its gonna be DELISH! I will post photos on Friday and I will continue with some gift guides and posts on interiors so you don't get too bored in case your Holiday shopping is all done. sounds wonderful! Have a wonderful Thanksgiving. I adore that Joe Nye table! I hope you and your family have a wonderful Thanksgiving, Albertina! That table setting is absolutely gorgeous! So bright and cheery. Happy Thanksgiving my dear friend. That table setting is absolutely gorgeous! Happy thansgiving !!!! Happy Happy Thanksgiving! 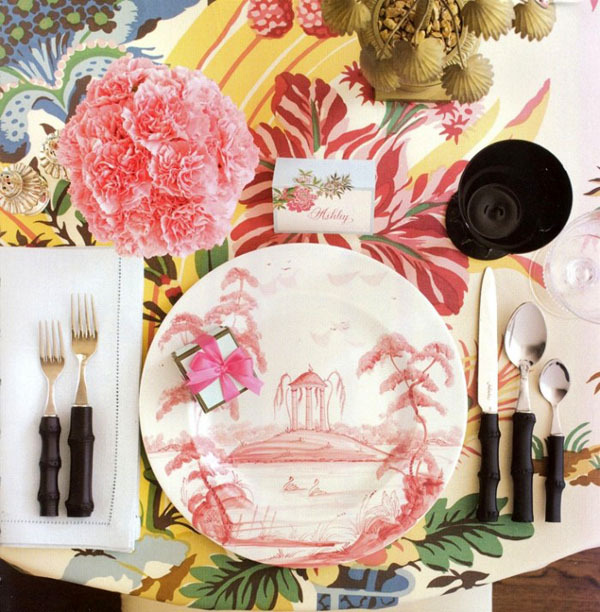 This is a fabulous table setting & so glad I found your blog! Hope you had a wonderful Thanksgiving! That dessert looks delish!